The country's top court on Thursday dismissed a former Navy chief's appeal to a sentence of four years in prison for taking kickbacks from defense contractors. 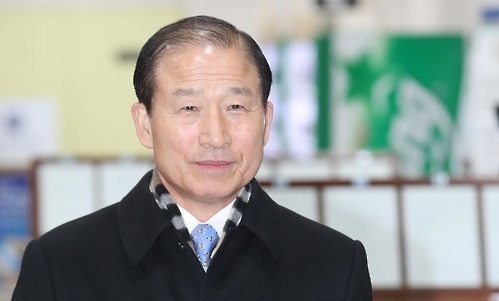 Jung Ok-keun, chief of naval operations from 2008 to 2010, was indicted in March 2015 for pressuring two affiliates of the now-defunct STX Group in 2008 into offering 770 million won ($671,726) to his son's yacht firm in return for business favors. Ending a two-year legal battle, the Supreme Court confirmed his conviction of third-party bribery. A lower court sentenced him to 10 years in prison for bribery and an appeals court reduced it to four years. The highest court in June last year ordered a retrial saying that Jung did not directly receive the money. The prosecution changed his charge to third-party bribery, which applies to a person who exerts influence to help a third person or entity take bribes. In February, he received four years in prison on that charge. He raised an objection, which the top court dismissed.